Did you know December 4 is National Cookie Day? Neither did I, but for years my mom and I (and my sister depending on her schedule) get together and make holiday cookies. I always look forward to the day. I load up my mixer and supplies and head out to my parents and then it is a whole day of cookies! At the end of the day, I package them up and drive around to friends’ house leaving them on their doorstep. 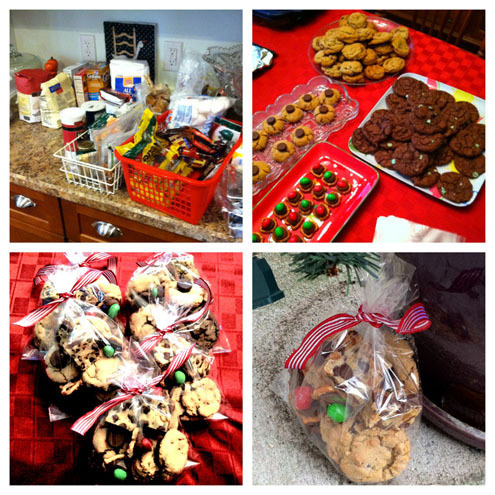 This year we made dark chocolate chip cookies, mint chocolate chip cookies, peanut butter blossoms, magic layer bars, raspberry bars, peanut butter chocolate bars and pretzel M&M buttons. We totally forgot peanuts so we couldn’t make birds next (pretzels, peanuts mixed in white chocolate). I was going to try to make turtles, but reviewing the recipe it seemed really involved and I like being able to mix up a batch, drop on pans and bake. Maybe another day when I have time.